Description Duplicate of actual stock category appended to the bottom of the stocks list, _or_ a potentially harmful "items" category which can cause crashes. Steps To Reproduce "z", select "stocks", look at the end of the list. Good luck. Additional Information The normal stock listing always shows an extra entry at the bottom of the list, just below "codices". This can be anything from "armor" to "anvils" to "cloth" etc., giving a faithful duplicate of the category's status. I can see no pattern which category is duplicated. More problematically, the entry can also be "items" with an apparently random, often ridiculously large (many million) number, and i've twice experienced crashes when trying to open the stocks screen or selecting the faulty entry. It may access uninitialised or incompatible memory. The behaviour shows up in both .43.03 regions i've created. related to 0009593 acknowledged lethosor Invisible caravan arrives, no units listed on units list, trade impossible. If it's not evidently visible on other Windows installations, a save wouldn't demonstrate a thing. Note "anvils" and "armor" just below "codices". In this case, the numbers given are correct. 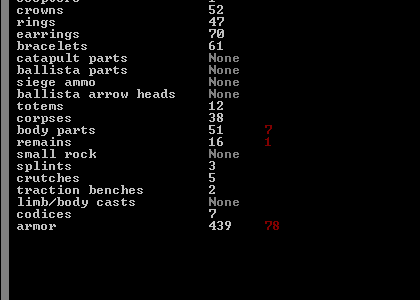 On a fresh embark, i got "items" with a number of "1000000000?" 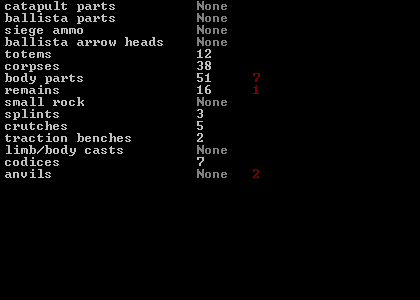 (brown), after saving and restoring i got "items", "400?" brown, "100000000?" or so red. Game didn't crash. Issue is unrelated to the given tickets, it's flaky behaviour of the basic interface. I can confirm that this also happens on the OSX 43.03 vanilla version. However, for me the duplicate entry sometimes changes when I open the stocks screen (the first time, it listed items, the second and third, bars, now it's back to items again). I can't confirm the crash (no bookkeeper at this point). The new branch type for making stone axes was causing trouble. It'll be fixed for next time.